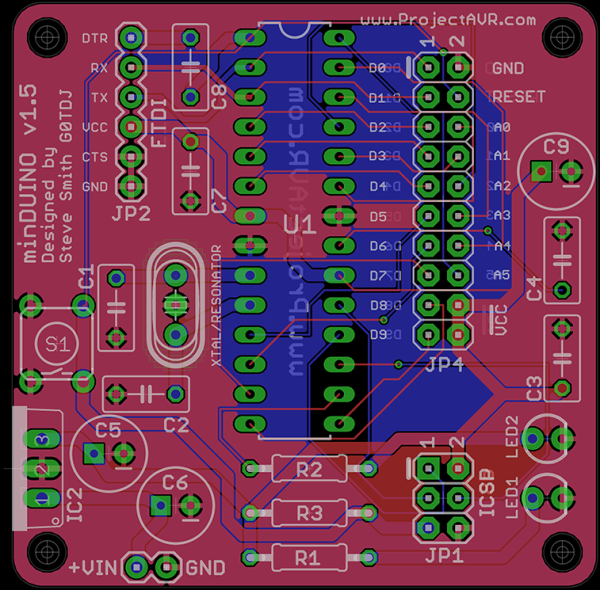 minDUINO v1.5 – A Small Footprint, Educational Arduino™ clone. This webpage holds all the design files and information to make and program the minDUINO v1.5 board. The design is released under Creative Commons Attribution Share-Alike. This means that you can freely copy the design and adapt it for your own purposes provided you attribute the design to ‘ProjectAVR – Steve Smith G0TDJ’ and use the same license for your adapted designs. Full information on the Creative Commons website. The intention is to make this design Open Hardware. The v1.5 board is as yet untested although the circuit is basically the same. v1.4 board design files are still available here. If you look online you will find a myriad of Arduino™ clones of all different shapes and sizes. So why would I want to produce yet another? The truth is, I love designing things. I was also inspired to create this board because my friends daughter, I will call her Amelia, has found an interest in electronics. Amelia’s father and I have given her several things to build, commercially available kits, but I wanted to encourage her to experiment. Since I have a familiarity with AVRs and Arduino™, I elected to follow that path. The minDUINO is designed to be easy to assemble, so it is a two layer through-hole design, not SMD. It has headers for FTDI, ISCP and port breakouts. Another project I designed was VAYU-NTX, a High Altitude Balloon Tracker. As expansion for this, I designed two small daughter boards for experimenting with. I followed a similar idea with the minDUINO and placed the breakout headers together. Later on, I may design a bespoke board but its just as easy to use stripboard/perfboard paired with the appropriate header socket.